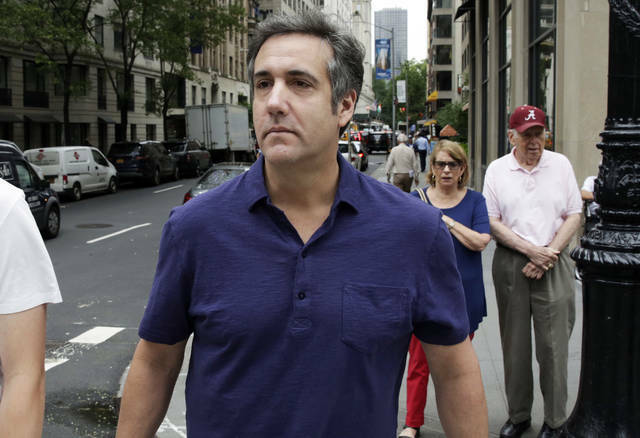 NEW YORK (AP) — Two people familiar with the federal investigation of Michael Cohen told The Associated Press prosecutors are preparing criminal charges against the former personal lawyer of Donald Trump that could be brought this month. These people confirmed reports Cohen could face charges including bank fraud related to his financial dealings with the taxi industry. The people weren’t authorized to discuss the probe and spoke Monday on condition of anonymity. The New York Times reported Sunday, based on anonymous sources, that prosecutors have been focusing on more than $20 million in loans obtained by taxi businesses that Cohen and his family own. Cohen’s lawyer Lanny Davis declined comment. We need strong tools to guard against national security threats to our technology from countries like China. That’s why I’ve spent this year working with my Republican counterpart on the Banking Committee, Senator Mike Crapo, to strengthen the tools the U.S. uses to block national security threats posed by investments from China and other countries. Our provision passed Congress last month on a broad, bipartisan vote, as part of the National Defense Authorization Act. It’s now been sent to the President’s desk and will be signed into law. Our bill will modernize and strengthen the Committee on Foreign Investment in the United States – known as CFIUS. CFIUS is responsible for screening foreign investments for national security threats, and blocking investments that undermine our national security. But lately, countries like China have adopted new tactics to acquire our critical technology and know-how, while the laws that give CFIUS its authority haven’t kept up. That’s why I introduced this bipartisan bill, to ensure CFIUS has the tools it needs to tackle today’s threats. The bill will make these tactics harder by strengthening the review process and enforcement, particularly when it comes to critical technology and investments from state-owned enterprises. No country has been more aggressive than China in going after American technology in sectors like aviation, robotics, new energy vehicles, and others where the U.S. has established ourselves as a global leader. In just three years, from 2013 to 2015, the number of Chinese acquisitions coming under CFIUS review jumped 38 percent. And China is getting sneakier, finding ways to get around the rules to avoid review all together. This bill is just a first step. I’ve also worked with Republican Senator Chuck Grassley on bipartisan legislation to empower the Department of Commerce to begin screening foreign investments for their long-term economic impact and consequences for American workers and American businesses. Of course we welcome investment from anyone that will create jobs and grow the U.S. economy – but we need strong safeguards in place to make sure those deals don’t threaten our national security or American jobs. This month, we’re taking an important step in the right direction. How is Trump doing in his fake MAGA quest? MPGA? Make Putin Great Again? My career as an activist since the 1960s has focused on a critique of my own government’s activities, since we live in a democracy and our government’s actions are done in our names. Well, I said when I felt it appropriate, not in mine. No threats to annihilate cities anywhere in my name. No invasion of Iraq in my name. Been arrested, cuffed and stuffed, sent to prison for some fairly robust nonviolence. And yet now I find myself almost sympathetic to the FBI, the same organization that played many dirty tricks against peace and justice organizations over the decades. I even feel some sympathy for some CIA officials, the same organization that disgraced itself in Iran, Congo, Chile and other places. How can this be? From where can these unbidden sympathies arise? Strzok was one of the lead agents in 2016 investigating both Hillary Clinton’s improper use of email (sending official emails from a private account) and the Russian espionage on behalf of Donald Trump to get him elected. His conclusion was that Clinton’s email kerfuffle was a nothing burger and the Trump/Putin collusion/conspiracy was a foreign government’s attack on US democracy. A successful attack. So, of course, Trump had to fire him. I am sickened by Putin and his murderous ways—killing journalists, arresting gays, defending chemical weapons-user Bashir al-Assad, etc.—but Trump loves a strongman. He seems to be mentored by Putin, he cozies up to other brutal leaders like mass murderer Rodrigo Duterte (who is currently buying submarines from Putin), and yet Trump’s base sticks with him, apparently more filled with hatred for peace and justice than care about democracy. The irony is inescapable. Trump evaded military service in Vietnam like most rich boys—his excuse was “bone spurs” in a fake news excuse from 50 years ago. Now he praises “his” military but mostly sends off a budget that covers obscene war profits for weapons manufacturers. The people of Russia are my friends; their leader is not their friend nor mine. The people of America are not properly served or represented by Trump, a treasonous greed-head and wannabe dictator. He’s firing his detractors as fast as possible, fearful of an actual justice system that is coming close to charging him with impeachable offenses such as his demonstrable Obstruction of Justice, and he’s even defending Alex Jones, the way-way cray-cray who calls Democrats aliens, not human, who advocates killing Hillary Clinton and others. Trump has complimented Jones, appeared on his show, and stripped John Brennan and others of their security clearance and is firing his way toward a Department of Justice that is a Deep State for Trump. Of course Trump’s many lawyers are spreading fake news as fast as possible. But their lead, Rudolph Giuliani, tops them all when he says Trump won’t submit to an interview by Robert Mueller, the Special Counsel investigating the Russian role in getting Trump elected. Rudy actually said the proposed interview would be nothing more than an attempt to get Trump to commit perjury, something for which we all know Bill Clinton was impeached. But there is one way to absolutely beat any chance of perjury, the method that Rudy and Donald never mastered and never will: Just Tell the Truth. Dr. Tom H. Hastings is PeaceVoiceDirector and on occasion an expert witness for the defense in court. Seems like every day brings a report of some new atrocity resulting from US wars somewhere in the world. It’s getting to the point it is a full time job just to keep up on them. Doesn’t pay very well, and it’s depressing, it’s a dirty job, but somebody has to do it. Don’t they? I am puzzled. 9-11-01 was carried out by 19 hijackers, 15 of whom were Saudis. Maybe the Saudi government or some of its members or minions were involved. But the USA invaded Afghanistan and Iraq and Libya, and threatens Iran? Some magical sleight of hand is exercised and Saudi Arabia is our friend and we arm them to kill kids in Yemen, one of the five poorest nations in the world—average annual income $449? I have nothing but questions on this. No answers. Is it heroic to bomb kids? Are these my new and improved and exceptional “heroes”—kid bombers? Do I thank the Saudis for their service? How about the US military personnel who fuel their planes, and provide the munitions? Or the mercenary contractors? Whom do I thank? Do I thank the Congress that takes my tax dollars to bomb kids? Do the congress people get their cut? The President who signs the “deals” to carry it out (hint: he may not have divested himself of his many military contractor/weapons-manufacturing investments and now he makes policy that helps them and him profit every day)? The Courts who refuse to hear legal challenges to the apparent illegality of non-declared wars contrary to the express language of the supreme law of the land? Whom can I thank? Kary Love is a Michigan attorney who has defended nuclear resisters, including some desperado nuns, in court for decades and will on occasion use blunt force satire or actual legal arguments to make a point. New students explore campus this weekend; returning students move in on Sunday, Aug. 19; classes start on Monday, Aug. 20. Westerville, OH—Otterbein University’s campus is buzzing with activity as new students explore campus before returning students move in on Sunday, Aug. 20. Students participating in fall sports and marching band have already moved in and are practicing for the new year. Classes for the 2018-2019 school year start on Monday, Aug. 20. New students moved in on Wednesday, Aug. 15, and have enjoyed a full schedule activities designed to help them get acquainted with campus and each other. This fall’s first-year class exceeds 23 percent students of color, or 139 students; it is the most diverse class in Otterbein’s history, for the fifth year in a row. Overall diversity at Otterbein is 20 percent across all classes. Thirty-four percent of the entering class is eligible for the federal Pell grant. The class’s average GPA is 3.57. Otterbein also has 19 new international students this fall and two international scholars, representing 10 countries. The students come from Australia, Brazil, China, England, Germany, Japan, Jordan, Malaysia, South Korea and Taiwan.